How do I view and modify the default System Paths in SQL-RD? The System tab located on the Options window is where you can configure the the default folder locations that are used by SQL-RD. Cached Data Folder: SQL-RD stores information which is used by event-based and other schedules. Snapshots folder: This is where Snapshots will be stored. 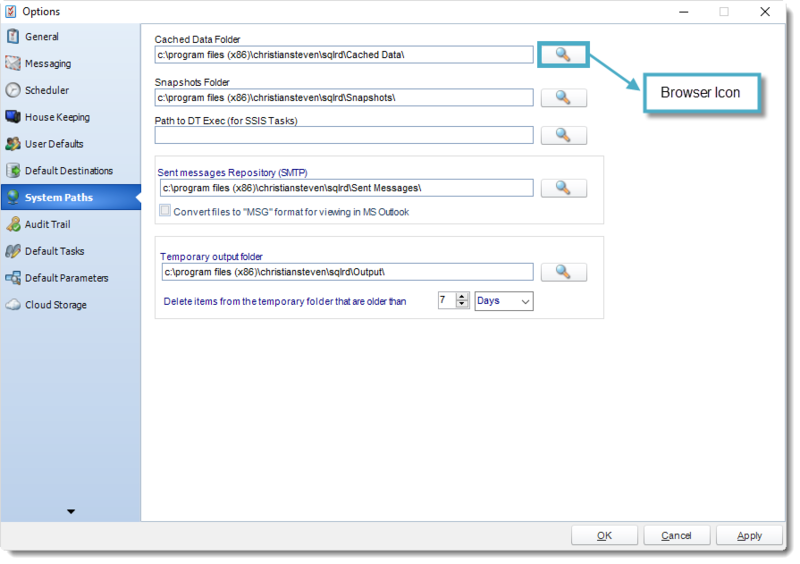 Path to DT Exec (for SSIS Tasks): Custom Task which runs SSIS on your SQL Server. DT Exec stores all the location of where DT Exec is. Sent Messages Repository (SMTP): SQL-RD will use this folder to store information on your sent email messages via your configured SMTP server. You can also set SQL-RD to convert the files to *.msg format for viewing in MS Outlook. Please note that the files are converted on the fly on viewing them from the sent messages section in the System Monitor. If you do not check the box next to "convert files to MSG format", sent messages will save to this folder as .eml files. However, if you navigate to the Email Log in the System Monitor and click on one of the entries, the .eml file will be converted to a .msg file so that it can be viewed successfully. Temporary Output Folder: SQL-RD uses this folder to store temporary files. To automatically clear down this folder so that your PC does not run out of disk space, you can set how long the items in the temporary folder should be kept.